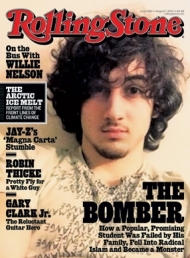 Rolling Stone magazine has a picture of indicted Boston Marathon bombing suspect Dzhokhar Tsarnaev on the Aug 1, 2013, cover with a detailed feature piece “Jahar’s World”  inside, written by Rolling Stone editor Janet Reitman. After reading many excellent articles on the financial machinations of the Wall Street banksters in Rolling Stone by Matt Taibbi, I certainly expected more than the Rolling Stone and Ms Reitman delivered. Someone, somewhere, made the observation that Rolling Stone had made Dzhokhar, or “Jahar” as the Rolling Stone article tells us he was known to his American friends, appear as a rock star. The uproar from low information Americans is now over portraying a guilty terrorist as a rock star. Since Rolling Stone covers rock stars, just the simple act of putting Dzhokhar’s picture on the cover and writing an article about him is evidently, to many Americans, the same as putting him on a rock star plateau. The fact that at this juncture, he has been convicted of absolutely nothing, is immaterial to those in our society that are only too happy to let U.S. Justice Department, FBI, CIA, Homeland Security and the corporate media do their thinking for them. I’m too old to get excited about current rock stars and when I was of rock star worshiping age, I had other interests. So at this late stage in my development, I have this giant black hole and a very poor knowledge of rock musicians. But what I do have, are issues with Ms Reitman’s article. And the disclaimer by the editors at the beginning of the article. What exactly is the intent of the Rolling Stone in this 11,000 word piece of journalistic fluff? Is it to make Dzhokhar a rock star? Or is it to advance the official story to a younger hipper audience: two immigrant Muslim brothers, radicalized terrorists who kill and main innocent civilians in cold blood without remorse on Patriot Day in Boston and in doing so embroil the country in an infantile debate over whether the monster bomber should be portrayed on the cover of a magazine that features rock stars in lieu of examining very disturbing cracks in the official story? Omission: omitting storylines that question the official version of events. Dismissal and Lack of Emphasis: mentioning other storylines and then dismissing them without a thorough examination, or any examination for that matter. This is the only mention of the CIA and FBI until the end of the article when the FBI interrogates Jahar’s friends after the Marathon bombing. There is no further mention of the CIA. Zubeidat Tsarnaev, mother of the Tsarnaev brothers, describing the relationship Tamerlan had with FBI agents who came to her house at least 5 times from 2008–2012. Of course it’s possible that the mother is lying, just as it is possible that she is telling the truth. But an objective examination of the Marathon Bombing demands attention to all FBI and CIA activity with the Tsarnaev brothers. The Rolling Stone deems them both guilty without the benefit of a messy trial. Even some of the Democrat and Republican Congress members are in agreement that we need answers from the FBI. House of Representatives Homeland Security Committee members of both political stripes were calling for answers in a rare instance of bipartisanship. Of course this is just political grandstanding, evident because there seems to be no groundswell of support from corporate politicians to investigate the “Ignored Bombshell” cited further below. “The Russians say they warned the United States in 2011 that Tamerlan Tsarnaev might be planning to travel to Chechnya to meet with Islamist radicals. The FBI insists the warning was vague, but won’t produce it. Was Tamerlan Tsarnaev an FBI Informant? Peter Dale Scott advances the hypothesis that Tamerlan Tsarnaev may have been an FBI informant. The FBI intimidates and pressures thousands of people into becoming informants as a way to make a minor legal problem go away. In Tamerlan’s case this could easily could have been his expiring visa or perhaps a minor drug offense. This coercion would explain two incompatible events that subsequently took place. In 2012 he returned to Russia to renew his Russian passport so that he could then file an application for U.S. citizenship. This is what was keeping him from his dream of being an Olympic boxer. He then proceeded to jeopardize his passport application with his flamboyant behavior that was more a caricature of than characteristic of a Muslim extremist. He wore flashy clothes visiting his cousin in Dagestan, while in Massachusetts he had taken to wearing sweat pants and a bathrobe. He had to know that his attention grabbing behavior would be observed by the same Russian authorities that he was counting on to renew his passport. This would be consistent with both his mother and father’s statements that Tamerlan was under the FBI’s “control”. It would also explain Tamerlan’s reported YouTube page that featured multiple jihadist videos. It would also be consistent with his behavior upon returning to Massachusetts of disrupting a talk in a Cambridge mosque in which Martin Luther King was compared to the prophet Mohammed. All these actions in Dagestan and home in the U.S. are consistent with an FBI informant seeking to find and entrap others into statements and activities that can then be used against them by the FBI. Granted, one could say that the Tamerlan’s actions could also be interpreted as actions of one who has been driven to kill and maim innocent people in response to the U.S. governments illegal wars and treatment of Muslims in the Mideast. Neither position is certain and the hypothesis of Tamerlan as an FBI informant does explain the contradiction above that the official story of Tamerlan as a Muslim terrorist does not. This is nothing new, the FBI has been widely using such tactics since the COINTELPRO (Counter Intelligence Program) from 1956–1971. It is clear that there was some sort of relationship between the FBI and Tamerlan. 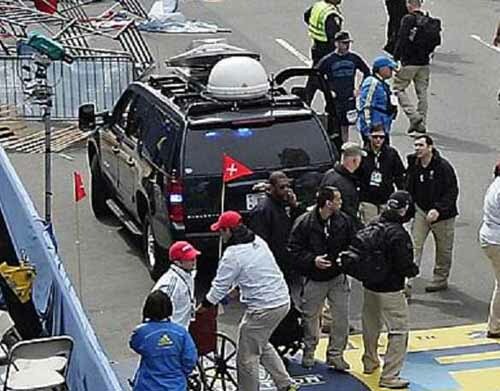 Why then was the FBI not able to identify Tamerlan from the surveillance videos near the Boston Marathon finish line? We know that the FBI, Homeland Security and the CIA extensively use facial recognition software, why did they not use it here? Why did the FBI agents who had interviewed and visited Tamerlan not recognize him from the videos? Instead we the public were asked to identify the two suspects by viewing the video supplied by the FBI to the exclusion of any other photos that may exist. Did Jahar’s Friends Destroy or Plant Evidence? Rolling Stone relates the FBI account that three days after the bombing, three of Jahar’s friends from school saw the video on TV of the bombing suspects and texted Jahar that he looked like one of the suspects. The three then went to Jahar’s dorm where his roommate told them that Jahar had left campus several hours earlier. They hung out in the room watching a movie and spotted Jahar’s backpack. They noticed fireworks inside that had been emptied of powder. Unsure of what to do they grabbed the backpack and Jahar’s computer and went to one of their off-campus apartments, where they “started to freak out, because it became clear from a CNN report . . . that Jahar was one of the Boston Marathon bombers,”  one of them later told the FBI. Which has the greater probability for truth? That three youths discovered their friend was one of the Boston Marathon bombers and then proceeded to attempt to destroy evidence and risk a possible death or life sentence for themselves in doing so? Or that these same three youths were coerced by the threats of FBI agents to implicate them in the Marathon Bombing unless they planted evidence and went along with the FBI’s story? We can speculate. But without a truly independent investigation of all related actions, we will remain in the dark and Rolling Stone has done nothing to shine light on any of this. Then there is the whole question of the backpacks. Basically, the exploded backpacks did not match the backpacks worn by the Tsarnaev brothers in the video released by the FBI. The Rolling Stone did mention this near the end of the long article, relegating it to “conspiracy theories about the bombing”. Independent Journalist Dave Lindorff discusses the backpacks. FBI image of exploded pack with white square, white square on Craft guy's pack, and Tamerlan Tsarnaev (left.) with pack but clearly no white square marking. Craft International was not even mentioned by Rolling Stone. Seven apparent Craft International rent-a-soldiers behind and departing (top rt. with backpack) a communications van. The Fund of Caucasus denies any relationship with Tamerlan Tsarnaev,  yet the Jamestown Fund listed Uncle Rulan’s father in law CIA Kabul Office Chief Graham Fuller’s home address in the U.S. as its own. Allegations tying the Tsarnaeva family to NGOs and the CIA open up a whole new can of worms that I do not have the expertise with which to deal. Tsarnaeva brothers’ Uncle Ruslan Tsarni (formerly Tsarnaeva), now an attorney and a well connected oil executive of Montgomery Village, MD was quick to denounce his nephews when they were first implicated in the bombings. Those paying attention to the real news and not the corporate news now know he has very close ties to the CIA and was formerly married to Samantha Ankara Fuller, the daughter of a former top CIA official Graham Fuller. Ties to NGOs that foment revolution, CIA, FBI; why is this important? It goes to possible explanations that make sense. Is it possible that the brothers were doing the bidding of handlers (CIA, FBI) that were staging a terrorist attack as a false flag operation? Is it possible that the bombs weren’t meant to blow up, but that the Craft International personnel were positioned to save the day and something went terribly wrong? And maybe none of this is true, but only a truly independent investigation will allow us to find out. Joe Giambrone in “Uncle Ruslan Tsarni’s Organization May Have Funded Terrorists” develops the premise of possible CIA involvement much deeper here. Uncle Ruslan’s CIA ties and reports of CIA front NGOs having close contact with Tamerlan are an important part of the overall story and need to be examined. The Rolling Stone neglected to mention any of this. The above account in the Rolling Stone is the only mention of Tamerlan being a person of interest in a triple homicide of his close friend Brendan Mess and two others on the tenth anniversary of the 9/11 attacks. The Rolling Stone makes no mention at all of an FBI agent on May 22, five weeks after the Marathon Bombing, fatally shooting unarmed Ibragim Todashev seven times after he allegedly confessed that he and Tamerlan Tsarnaev had committed the above mentioned triple homicide. Did it occur to anyone at Rolling Stone or the corporate media that local police officers from suburban Waltham who had Tamerlan as a person of interest in the grisliest homicide in their lifetimes should have been able to identify him from the surveillance video released by the FBI as one of the two suspects? Everybody in the country saw that video and yet no one from all the police agencies investigating the most horrific homicide in Waltham’s history could identify their number one person of interest in the homicide as one of the two bombing suspects from the FBI’s video? This is simply not believable. On May 22nd this bombshell appeared in the establishment New York Times and yet the corporate press still continues to not ask questions: “Deadly End to F.B.I. Queries on Tsarnaev and a Triple Killing”  Ibragim Todashev was shot by an FBI agent in Orlando, FL condo after confessing that he and Tamerlan Tsarnaev had killed three people in the Boston suburb of Waltham on Sept 11, 2011. Notice that it happened on the 10th anniversary of the 9/11 terrorist attacks. Whether this is of significance in not known. The FBI’s description of the events has changed several times since we were informed that Mr. Todashev was shot and killed by an FBI agent interrogating him in Orlando, Florida. Mr. Todashev and Tamerlan Tsarnaev were acquaintances in the Boston area. They were both involved in boxing and martial arts together. On the evening of May 21, 3 FBI agents and several Massachusetts state police interrogated Mr. Todashev for at least 5 hours about the Waltham murders. They had previously questioned him at least two other times. During this interrogation we are told that Mr. Todashev confessed that he and Tamerlan Tsarnaev committed the triple homicide in Waltham, but this was unrecorded. We are expected to believe that Mr. Todashev, worried about being framed for the triple homicide, did not have the presence of mind to request a lawyer. Two of the FBI agents then left the scene. I believe it was Mr. Todashev’s condo. It is unclear whether police officers stayed in the room with the remaining FBI agent or not. There have been conflicting reports. Later it was reported, “Mr. Todashev, according to the F.B.I., confessed to his involvement in the deaths and implicated Mr. Tsarnaev. He then started to write a statement admitting his involvement while sitting at a table across from the agent and one of the detectives when the agent briefly looked away, the official said. At that moment, Mr. Todashev picked up the table and threw it at the agent, knocking him to the ground. “Nevertheless, several friends of the victims noted that each of them had been selling drugs for years and could only recall one episode of violence: Mess was once severely beaten after coming up short in a payment to a drug supplier. ‘They had all been [selling drugs] peacefully for a long time without a problem,’ one friend said. But what stands out for friends of the victims struggling to make sense of the possibility that Tsarnaev and Todashev were the killers is the friendship shared by Mess and Tsarnaev. The two young men grew up in the same Cambridge neighborhood, attended the same high school, and often worked out together. On June 9, a full 18 days after Todashev was shot to death, the Orlando Sentinel reported that the U.S. Dept of Justice Civil Rights Division had pledged to conduct a separate investigation into the FBI’s fatal shooting. This in response to the American Civil Liberties Union and the Florida Chapter of the Council on American-Islamic Relations calling for an independent examination of the shooting. Since both the FBI and the Civil Rights Division are part of the Dept of Justice, the Civil Rights Division inquiry cannot be considered an independent investigation. “The FBI has refused to publicly release specific information about the confrontation or how many law-enforcement officials were interviewing Todashev. Todashev’s father, Abdulbaki called for an independent investigation at a Moscow news conference. The New York Times investigated FBI shootings over the past 20 years. They found a total of 150 shootings in which agents had either killed or wounded someone. Of these 70 were fatal and 80 resulted in injury. After investigating the 150 shootings, the FBI found no fault at all with any of them. They have a perfect score, at least after they investigate, because when there is an FBI shooting all lesser local, state and federal agencies leave the investigation and determination of guilt entirely to the FBI, who happens to be perfect. So we can all rest assured that when the FBI deigns to report to the public exactly why an agent needed to shoot an unarmed man 7 times to prevent him from being able to later deny that he had confessed and implicated another dead suspect and friend in a grisly triple homicide of the other dead suspect’s best friend and two others; the FBI agent will be completely exonerated of any wrongdoing. Of course none of this was of any interest at all to Rolling Stone and Janet Reitman. How are democracy and justice in the U.S. served when the main-stream corporate media refuses to do its job? And if that’s not bad enough, how poorly are both served when main-stream alternatives like Rolling Stone serve up fluff like “Jahar’s World”?